Italian Level 3 includes another 15 hours of spoken language practice and one additional hour of reading instruction and is designed to be used after completion of levels 1 and 2. The beginning lessons of level 3 offer you the chance to expand your vocabulary and increase your fluency to an even higher level. You'll gain experience participating in many informal and some formal discussions on practical, social, and semiprofessional topics. Italian Level 1 includes 15 hours of spoken language practice and one hour of reading instruction in thirty 30-minute lessons. In the first 10 lessons, you'll cover the basics: saying hello, asking for or giving information, scheduling a meal or a meeting, asking for or giving basic directions, and much more. Learn Italian while driving to work! A new 30-unit course designed to be completed after Italian Level 3 (replaces the Italian Phase 4, Units 1-10 course). Thirty 30-minute lessons totaling 15 hours of spoken Italian language learning, plus one hour of reading lessons designed to expand your vocabulary, expose you to a variety of cultural events, and give you practice reading and hearing Italian. Whether you want to travel, communicate with friends or colleagues, reconnect with family, or just understand more of what's going on in the world around you, learning Italian will expand your horizons and immeasurably enrich your life. The best part is that it doesn't have to be difficult or take years to master. Thirty minutes a day is all it takes, and we get you speaking right from the first day. French Level 4 is a new 30-unit course designed to be completed after French Phase 3, Units 1-30 (which replaces the French Phase 4, Units 1-10 course). Thirty 32-minute lessons totaling 15 hours of spoken French language learning, plus 80 minutes of reading lessons designed to expand your vocabulary, give you practice reading and hearing French and bring you one step closer to reading French for pleasure. French Level 3 includes another 15 hours of spoken language practice and one additional hour of reading instruction and is designed to be used after completion of levels one and two. The beginning lessons of French Level 3 offer you the chance to expand your vocabulary and increase your fluency to an even higher level. Pimsleur French Level 5 is a new 30-lesson course designed to be taken after Pimsleur's French Level 4. Thirty 30-minute lessons totaling 15 hours of spoken French language learning - plus 75 minutes of reading practice, reading, and hearing a short story - allow you to read French for pleasure. 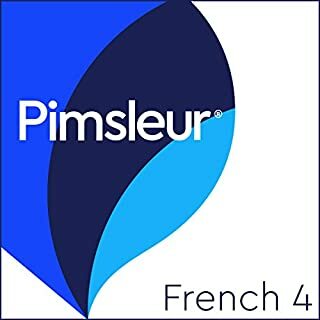 Builds upon skills taught in Pimsleur's French levels one through four. You'll be speaking and understanding French with near fluency and with a broad range of conversational skills. German Level 1 includes 15 hours of spoken language practice and one hour of reading instruction in thirty 30-minute lessons. In the first 10 lessons, you'll cover the basics: saying hello, asking for or giving information, scheduling a meal or a meeting, asking for or giving basic directions, and much more. German Level 3 includes another 15 hours of spoken language practice and one additional hour of reading instruction and is designed to be used after completion of phases one and two. The beginning lessons of phase three offer you the chance to expand your vocabulary and increase your fluency to an even higher level. You'll gain experience participating in many informal and some formal discussions on practical, social, and semiprofessional topics. Pimsleur is making living in Germany wonderful! Can learning another language be as easy as speaking your own? Yes - with Pimsleur it's that easy. Learn on your own time, at your own pace, and wherever you choose. Italian Level 2includes 15 hours of spoken language practice and one additional hour of reading instruction and is designed to be used after completing level 1. In the first 10 lessons of level 2, you begin to use the past tense. Structures become more complex, and informal speech is introduced. Conversations become fuller, and learners are able to discuss business and social activities, manage shopping situations, and express their interests. As you progress, vocabulary is expanded, and fluency increases. The next 10 lessons of level 2 allow you to further combine and build upon known elements and produce longer and more complex sentences. You learn to bargain with shopkeepers, deal with business situations, get and give medical information, and discuss the weather. In the final 10 lessons of level 2, you’ve doubled your vocabulary and have several hundred structures to draw upon. You’ll gain experience asking for assistance, finding a location that is some distance away, and using relative structures - faster, slower, etc. Sports and leisure activities are explored as well as shopping, changing money, and future travel plans. By the end of level 2, you’re speaking at a midintermediate level with near-native pronunciation, and you are comfortable meeting most social demands and limited job requirements. Reading lessons are included at the end of lesson 30. These lessons, which total about one hour, are designed to give you practice reading Italian and to provide you with some insight into Italian culture with proverbs, common expressions, and a broad look at some of the things you’ll see when visiting an Italian-speaking country. A reading booklet to be used with the audio lessons is also included in PDF format. What made the experience of listening to Italian Phase 2, Units 1-30 the most enjoyable? There are no breaks or tag points to find the individual lessons. It is a nightmare to navigate. The instruction is good if you can tolerate this technical problem. I will likely try to find it in a library just have track markers. I love learning while driving or doing chores. I have this audiobook in my phone and so can learn whenever I have downtime or doing chores. one of the best features is that I can go at 1/2 speed to listen to every syllable carefully or speed it up to 3 times speed to test my fluency. I'm impressed with myself. An unavoidable downside is that I do have to take time to sit at a table to learn to read and write it. I just can't do it while driving. pimsleur offers a great booklet you can download. I prefer learning the how to speak italian with pimsleur over Babel. listening and speaking are the best way to go. I can speed up or slow down the spoken words as needed. something i cant do w Babel. however, I also own babel because I like the way it teaches reading and writing. if you had to chose one, I would strongly advise audible's pimsleur. The audible lessons are the best I have ever used, and I am learning quickly to speak Italian, but I have been unable to download the reading materials, and audible customer support has not been able to help me.